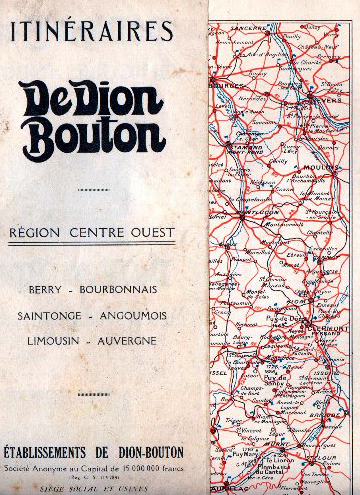 Of the many French marques with historic significance, De Dion Bouton was one of the most influential. By 1882 the company had already produced a self-propelling steam car and in 1890 patented a single cylinder petrol engine. Most of the early car manufacturers started out as bicycle manufacturers. 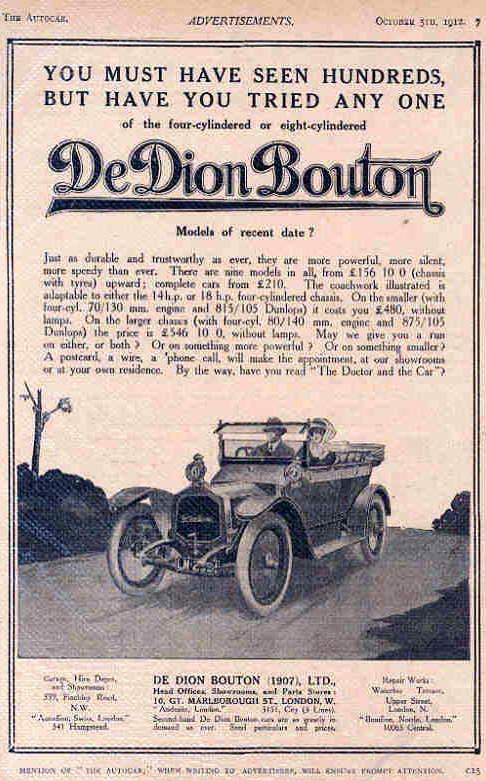 No doubt because of their early innovations with steam and petrol engines, De Dion Bouton’s cycle production appears to have started only in 1909. On 12th November, 1895 the Automobile Club de France – ACF – was formed by Baron de Zuylen, Comte de Dion and Paul Meyan. This was the world’s first automobile club. The Paris Motor Show followed three years later. The illustration below is of the 1903 Salon de l’Automobile at the Grand Palais. 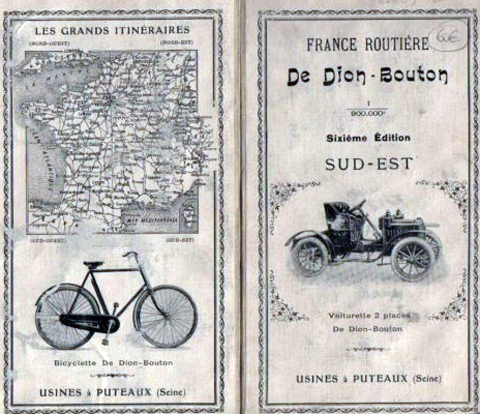 De Dion Bouton route maps of France, issued between 1900 and 1920, were part of a dynamic advertising campaign, and were a novel idea at the time. Marquis Albert De Dion was an industrialist and automotive genius. He pioneered many ‘firsts’ for the automotive industry and recognized the power and potential of the gasoline engine. He teamed with Georges Bouton, an engineer, and together they produced a self-propelled steam vehicle in 1882. To improve the ride of the vehicle a light rear axle was invented and later patented under the name ‘de Dion’. In 1890 they patented a gasoline single cylinder engine and in 1895 they were producing vehicles. The single cylinder engine was also used to power sporting tricycles until 1901. Over 150 motorcycle and car manufacturers purchased licenses to build the De Dion Bouton engine. 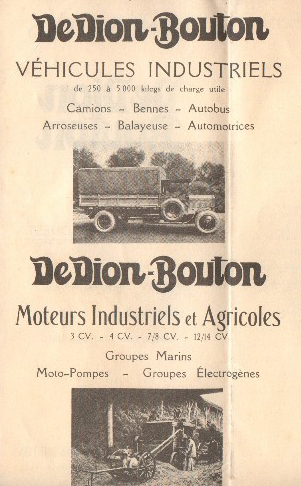 By 1900 De Dion Bouton was the world’s largest car manufacturer, with an annual production of 400 cars and 3,200 engines. 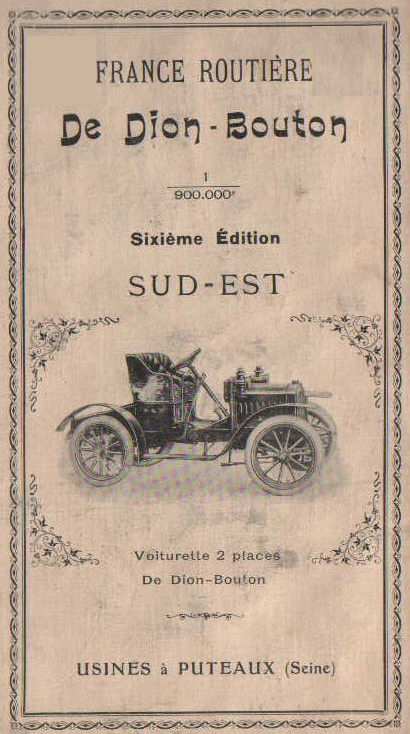 By 1904 De Dion had supplied over 40,000 engines produced by their Puteaux facility. 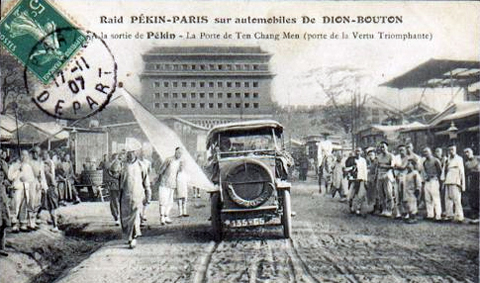 The End of de Dion Bouton: With national tragedies such as World War I and the onset of the Great Depression, the company struggled financially. During 1927 it ceased production temporarily and when it resumed it had a new 2.5-liter straight eight-cylinder and a 2-liter four-cylinder engine. Sales were sluggish so the decision was made to increase the displacement to 3-liters in 1930. The final car produced by the De Dion Company was in 1932. The company continued to make trucks through the 194os and, at the end, serviced cars, trucks, and motorcycles. Company names have always been a marketable commodity, and reputable car, motorcycle or bicycle manufacturer marques were often purchased after the company itself ceased trading. 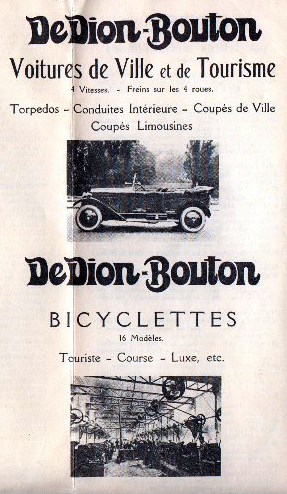 The De Dion Bouton name was bought by Dilecta in 1935 and, after WW2, Dilecta badged some of their bicycles and cyclemotors as De Dion Bouton le Blanc. Some BMA’s (cyclemotors under 100cc) were also sold using the De Dion Bouton name in the late 1920s, though it’s not known who made them. Though undoubtedly one of the world’s most important motoring pioneers, De Dion Bouton is not so well-known as a bicycle manufacturer. Nevertheless, their bicycles were made with as much attention to quality as three and four-wheelers. They had already been manufacturing tricycles for some time before adding bicycles to their sales line; they often sold trikes unbadged to allow other companies to mount the engines and market them under their individual names. 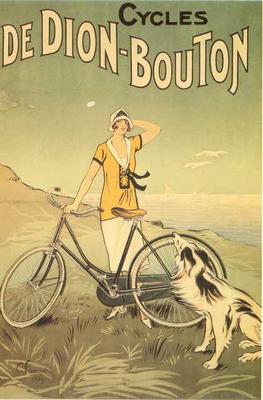 The earliest DeDion Bouton bicycle adverts I’ve seen are from 1909 (above and below). The article below, published on 25th February 1911, announces that the company decided to make bicycles around eight months previously. 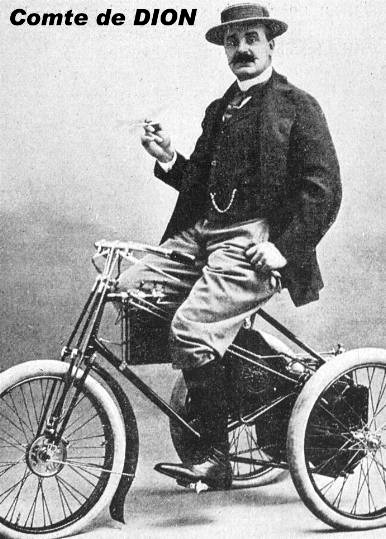 It illustrates a bicycle without brakes, similar to the one pictured in the 1909 publicity, and also a model with brakes, which is identical to the bicycle featured here. So my assumption is that brakes were introduced to the bicycle range in 1911. This bicycle was featured on the De Dion Bouton stand at at the 1911 Expo Locomotion Grand Palais, which evolved into the renowned airshow. The French were pioneers of flight, and of course flying’s early years involved bicycles. The Tour de France has an odd heritage: its origins come from political conflict and a circulation war between competing sports newspapers. The editor of the main sports newspaper Le Velo supported Alfred Dreyfus in the notorious ‘Dreyfus Affair.’ The Comte de Dion was an anti-dreyfusard and helped set up a rival newspaper L’Auto. As a publicity stunt, the editor of L’Auto, Henri Desgrange, revived the Paris-Brest Road Race, which had last been run in 1891. But it did not create enough interest. So, in 1903, he established a bicycle race that covered 2400 kilometres in 19 days and embraced the whole of France. The name came from Le Tour de la France par deus enfants, a well-loved schoolbook that had sold six million copies since its publication in 1896. The Dreyfus Affair: With overtones of anti-semitism and post-war paranoia, Dreyfus was accused of selling secrets to France’s old enemy, the Germans. As different sides of society insisted he was guilty or innocent (he was eventually cleared but only after dishonour, discharge, and a rigged trial had banished him to an island prison camp) the split came close to civil war and still have their echoes in modern French society. Many felt that anti-Semitism led to identifying the Jewish Dreyfus as a scapegoat to protect the institution of the French Army. Two years later, in 1896, evidence came to light identifying a French Army major named Esterhazy as the real culprit. High-ranking military officials suppressed this new evidence and Esterhazy was unanimously acquitted on the second day of his court martial. Instead of being exonerated, Alfred Dreyfus was further accused on the based on false documents fabricated by French counter-intelligence officers covering their colleague Esterhazy. Word of the military court’s framing of Alfred Dreyfus and of an attendant cover-up began to spread, largely due to a vehement public protestation in a Paris newspaper by writer Emile Zola. The case had to be re-opened and Alfred Dreyfus was brought back from Guiana in 1899 to be tried again. The intense political and judicial scandal that ensued divided French society between those who supported Dreyfus (the Dreyfusards) and those who condemned him (the anti-Dreyfusards). France’s largest sports paper, Le Vélo, mixed sports coverage with political comment. Its editor, Pierre Giffard, believed Dreyfus innocent and said so, leading to acrid disagreement with his main advertisers. Among them were the automobile-maker the Comte de Dion and the industrialist Clément. Frustrated at Giffard’s politics at Le Vélo, they planned a rival paper. The editor was a prominent racing cyclist, Henri Desgrange, who had published a book of cycling tactics and training and was working as a publicity writer for Clément. The new paper became simply L’Auto, and was printed on yellow paper because Giffard used green. Circulation was sluggish, however, and only a crisis meeting called “to nail Giffard’s beak shut”, as Desgrange phrased it, came to its rescue. A 23-year-old cycling and rugby writer called Géo Lefèvre suggested a race round France, bigger than any other paper could rival and akin to six-day races on the track. 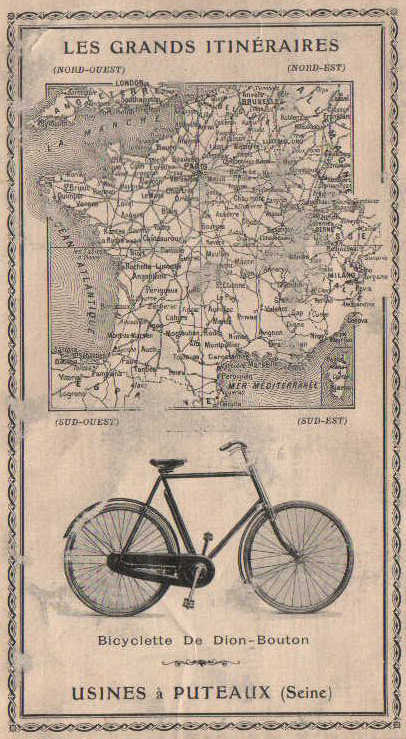 The Tour De France was the salvation of Le Vélo, a newspaper born to support the charges against Captain Dreyfus. Eventually, all the accusations against Alfred Dreyfus were demonstrated to be baseless. He was aquitted, retired as a Major, and returned to active duty in World War One, where he served his country honorably and left as a Lieutenant-Colonel.